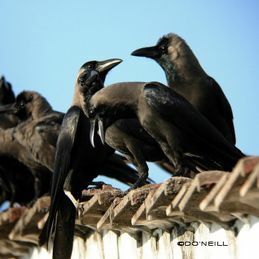 A pair of House Crows (Corvus splendens) was observed in a residential area perched on a television antenna. One was black and the other was a light brown colour- and that was something odd. Feather shafts of birds sink into the skin organ to receive the necessary nourishment for growth and endowment of birdsâ€™ plumages. Colours of feathers are determined by the genetic make up and quantity distribution of pigmentation cells present in the skin. Similar to Vitiligo in humans, Leucism in birds is a genetic disorder whereby the pigmentation cells are unevenly distributed, hence resulting in patches of feathers looking paler, bleached looking or show white. (While Albinism dictates that the skin body is totally devoid of pigmentation cell. Hence, if one looks into the iris of an albino, it always shows reddish-pink or near equivalent.) 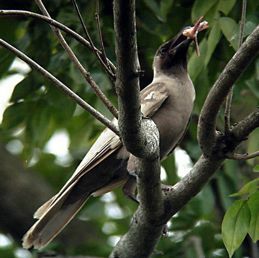 It has been observed that the leucistic House Crow was treated as an outcast and chased off by other crows while the former was scavenging and ate lunch. It is not a common phenomenon and science has yet to figure out why leucism occurs. Perhapsâ€¦ it is one of those things that Mother Nature, the divine architect sees fit â€“ to be allowed to mastermind mistakes now and then! And which ascertain that in our world, nothing and nobody is perfectâ€¦ and we be allowed to do so sometimes too. 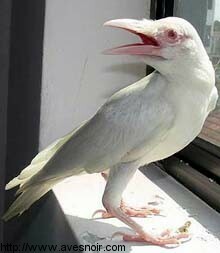 The White Crow or Raven has figured largely in mythology – both as being the original color of the bird before it swallowed the sun (and thus became black as night), as one of the animals released from Noah’s Ark, and also the alternate form of King Arthur of Camelot (and in some cases, Merlin). 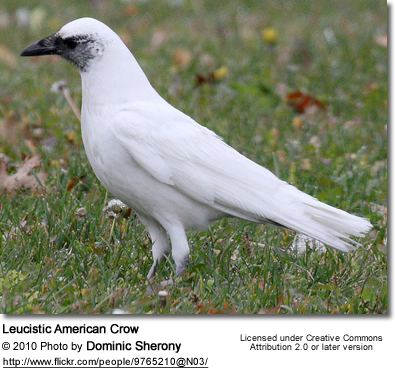 As recently spotlighted by CC&R, White Crows and Ravens never fail to make top news when found. This story on the Daily Mail quotes British Trust for Ornithology spokesman Tom Cadwallender as saying, “To have one white raven is extremely unusual, but for it to happen again in the same place and to have three white birds this time is unprecedented. Mr Cadwallender said it was likely the white ravens would have been rejected by their own kind.Â There have been several White corvids reported in singleÂ locations like this one, suggesting it is a strong genetic selection in some mating pairs.